August 1st, we were able to make the trek down to Tracy and participate in Clarke's Pinning Ceremony. A Pinning Ceremony is when firefighters raise their right hands and take the oath of office as a firefighter (or whatever rank they are promoting to) and promise to uphold the Constitution as a sworn public safety officer. Then a family member has the honor of "pinning" the badge onto the firefighter. Firefighters come dressed in their Class A uniforms (what you would see public officers wear for funerals), as do other public safety officers in attendance. Considering this was Clarke's 3rd pinning, we old pros at it now! 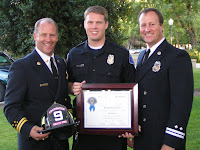 Clarke was pinned in 2004 as a Tracy Firefighter. About 3 years into his career at Tracy, an opportunity presented itself which allowed Clarke to be home and able to participate in Owen's therapy more by switching to another department. That "other" department provided us with Clarke 2nd pinning ceremony (no picture worth posting!). Well, we are back at Tracy (thankfully, and for good!) and wanted to make it offical by doing the pinning ceremony again! I actually wore the same skirt and shoes I wore at his first Tracy pinning (just to put an exclamation mark on the fact that we are happy and part of the Tracy family for good!). I truly do love being a firefighter's wife. What more could you ask for than a husband that is only gone for 48 hours and then home for 4 days straight (96 hours!). I am so proud of Clarke for what he has done in the past 5 years to support us! Here's to 25 more years.